Whether you are a competitive athlete or a week-end warrior, Wellness Garage coaching services can help you maximize your performance through our holistic approach to health and performance. 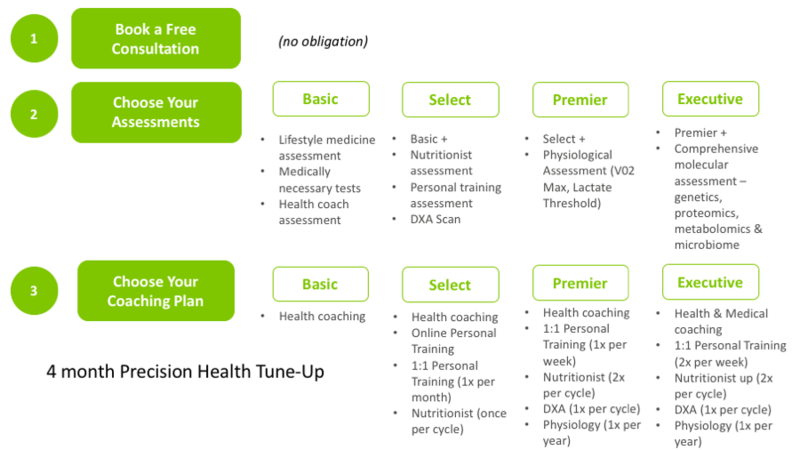 All Wellness Garage Personalized Precision Health Tune-Up’s start with a comprehensive lifestyle medical assessment, that identifies any medical issues and reviews your current training program, lifestyle behaviors and risk factors that contribute to performance. 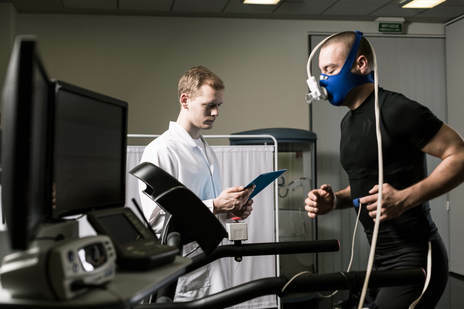 Using proven science, we design a Personalized Precision Health Tune-Up for you to optimize your training, adjust behaviors, modify risk factors and increase your performance. Wellness Garage augments your current training, working closely with your sport specific coach or helping you adjust your workouts based on our assessment. Detailed recommendations and plan to develop your own wellness practice to optimize your health and achieve your goals. 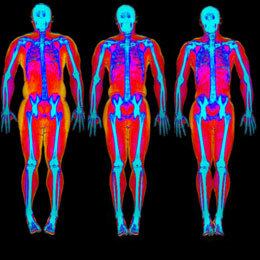 The gold standard for assessing body composition. Genetics: Detailed analysis of your genes provides insight into inherited traits, conditions, risk of diseases, and response to medications. The totality of your genes makes up your genome and provides a unique blueprint for your body. Proteomics: While your genome contains your genetic code to build proteins, it does not tell us what proteins are being made at any given time. Our advanced proteomic testing allows us to test for the presence and concentration of over 200 proteins in your blood including enzymes, hormones, and immune-response proteins. Proteins form the structure and drive the function of your body. The circulating proteins in your blood can reflect both real-time snapshots and long-term forecasts of the health of all your vital organs, including their structural integrity, functional status, and susceptibility to disease. Metabolomics: In combination with measuring your proteins, we also perform over 300 metabolites, including amino acids, vitamins, blood sugar, lipids, and cholesterol. Metabolites are the products of all the life-sustaining processes that occur in your body. 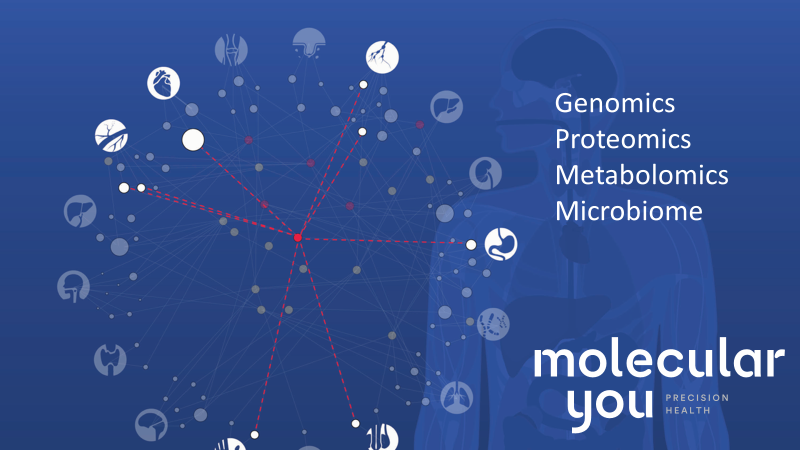 Our detailed analysis of your metabolic signature provides insights into your body’s nutritional status, toxin accumulation, and indicators of disease in real-time. Microbiomics: While the human body is comprised of 30 trillion human cells there are 40 trillion microbial cells residing within us. This ‘second genome’ is now known to contribute 15-30% of our circulating blood metabolites. The composition and diversity of your microbiome affects your susceptibility to inflammatory diseases and other illnesses as well as how you respond to medications and changes in diet or exercise. ​Our programs are built around a Precision Health Tune-Up of 4 months duration. 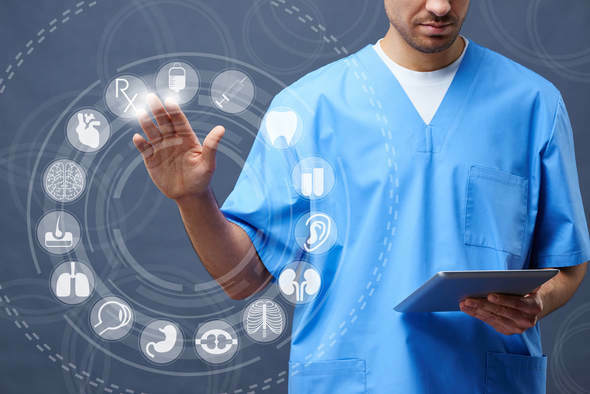 During this time we do a comprehensive assessment, develop and implement a personalized, precision health plan covering nutrition, exercise, sleep, stress, community and purpose – specifically addressing any health condition or risk factor. 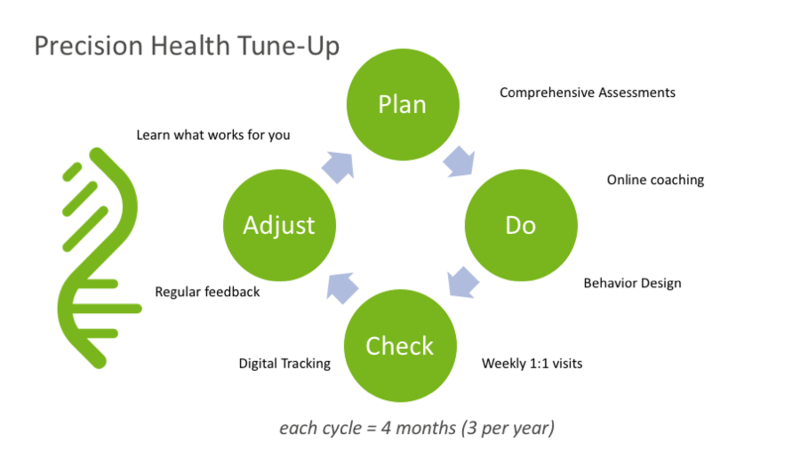 This plan is accompanied by online coaching, digital tracking and regular feedback during your bi-weekly coaching visits.